Can Bad Credit Prevent You From Landing a Job? "J.T. & Dale Talk Jobs" is the largest nationally syndicated career advice column in the country and can be found at JTandDale.com. Dear J.T. & Dale: My daughter graduated from college last year and, due to the economy, has found it difficult to find a job. On top of this, her credit has gone down the tubes. She's had numerous interviews, but so far, nothing. Is her credit affecting her ability to get hired? Can employers do credit checks without permission? — Margie Dale: From what you describe, your daughter's credit is going to be a problem, but it isn't The Problem. J.T. : I know where you're going. Most companies don't bother with background checks until they are ready to make a job offer, and typically will tell the employee getting hired is dependent upon a clean background check. So she would know just when it was going to be a problem. Dale: Exactly. Companies are required to get her permission. However, your daughter can't very well refuse, and, in fact, probably never would be asked — permission usually is specified in an employment application that she would have signed before an interview. J.T. 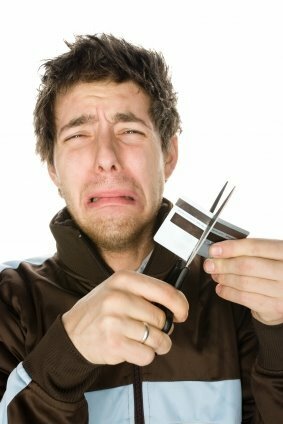 : So, how can she minimize the impact of her credit? First, she should work with an agency to improve her credit score. Also, she should make sure to have a list of references that includes people willing to comment on her character. When she reaches the position where a job offer is contingent on a background check, she can be honest about her credit history, then use the references to help the hiring manager look past her credit and give her a chance. Dale: Which brings me to The Problem: getting close enough to job offers to have the credit-check conversation. Perhaps you have a family friend who does hiring who could take your daughter through mock interviews. And get her to go to J.T. 's site, www.workitdaily.com, and under "free tools," find the Interview Prep tool. She also might get a friend to videotape her answering the questions ... I know, I know, Margie — I have kids, too — your daughter will roll her eyes and tell you she already knows how to make a good impression. But tell her, from us, to stop blaming her credit and start rehearsing interviews until she can convincingly play the role of a great young prospect. Jeanine "J.T." Tanner O'Donnell is a professional development specialist and founder of the career consulting firm, J.T. O'Donnell - Career Insights, and of the job search blog, CAREEREALISM. Dale Dauten resolves employment and other business disputes as a mediator with Agreement House. Please visit them at JTandDale.com, where you can send questions via e-mail, or write to them in care of King Features Syndicate, 300 W. 57th St, 15th Floor, New York, NY 10019. © 2009 by King Features Syndicate, Inc.